Ensure the longevity of your appliances with preventative and repair services from our company. Maintain a perfect temperature throughout your home with HVAC repair and maintenance. Broken faucets and faulty electrical outlets are no problem for Ronnie on the Spot, LLC. 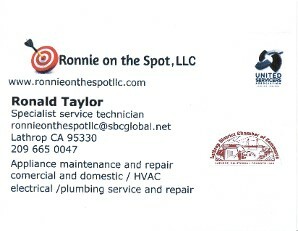 Resolve all of your appliance malfunctions with a simple call to Ronnie on the Spot, LLC, an Experienced Service Specialist in Lathrop, California. We provide repair and preventative maintenance for many types of commercial and domestic appliances at competitive rates. 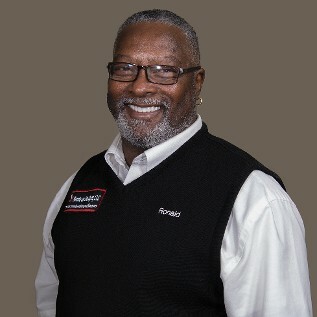 Our owner comes with 42 years plus experience and has an extensive tech background including having been an Engineering Manager for Marriott International and a Senior Tech at Stanford University for Housing and Dining Maintenance Services, you can rest assured as work is being done on your appliances. Our mission is to deliver the best service and attitude of any other service professional. Contact our Experienced Service Specialist company in Lathrop, California, to take advantage of our low rates for appliance repair.